I am frequently getting complains about Market not found error while installing apps on Bluestacks. Although, the solution is quite facile but it is difficult to explain it via comment box. So, I decided to write an article on this topic. But, at first, let’s discuss the reason for “Market not found” error on Bluestacks. Many people complain that when they search for an app on Bluestacks, it says “Market not found. Search web for installation recipe”. It is because Bluestacks cannot detect any installed local market. Whenever you install an app, it searches for a market (appstore) to get the installer file. And when it does not find it, the “Market not Found” error is reflected to you. Earlier, the Google Play services used to be pre-installed with your Bluestacks. Now, it is no longer pre-installed. Rather than some other appstores like 1Mobile and Amazon are bundled with it. But we cannot neglect Android Market as it is the most used and friendly-interfaced with Android OS. So, people suffer from “Market Not Found” error while installing apps on Bluestacks. 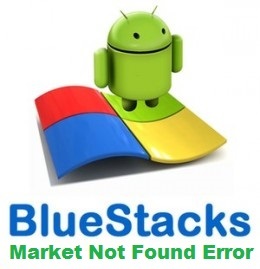 But do not worry, here is a step-by-step tutorial to fix Bluestacks Market not found error. Also Read: How to Fix Bluestacks Graphic Card Error 25000: Tips and Tricks. Download the apk file of the app. If it automatically opens with Bluestacks, then click on it. It will install the app successfully. That’s it. You’re done. Enjoy running the desired app on your Bluestacks. But the above method was not a proper fix to this issue. It was just an alternate method to install apps on Bluestacks. Below are some proper fixes to this error. 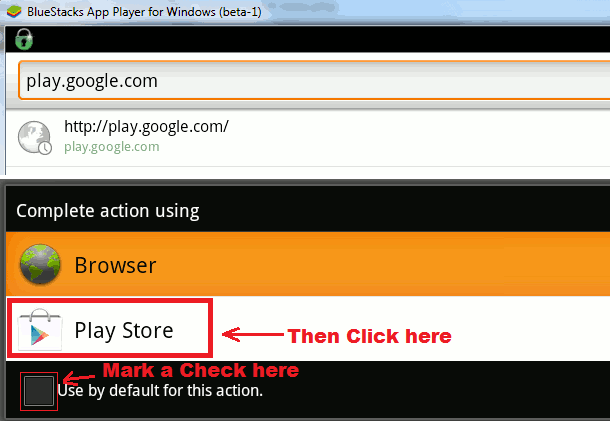 We will be changing the default Bluestacks app store to Google Play store in this method. Open Bluestacks. Select “My Apps” or “All Apps” (at top). Select “Help” from the list. Now, you will be redirected to Bluestacks help forum webpage. At the address bar, change the URL to play.google.com and press enter. Now, you would be asked to choose between browser or Play Store. Choose Play Store and check on “Use by Default for this action”. Now, if you have never used any Google services in your Bluestacks then you would be asked for account credentials. Enter you Google (gmail) username and password. Press enter. That’s it. You’re done. Now, all the installation of apps would open from Google Play Store. Also Read: Solution to Bluestacks Installation Failed MSI Log File Error: Fixed. As I said, the Google Play services used to be pre-installed with your Bluestacks. Now, it is no longer pre-installed. So, you have to install it manually. Download the following apps one by one in the given particular order from Google. Install it as shown in the solution 1. Open Google Play Store app. Fill your account details if it is not saved. Now, install the apps successfully from Google Market Play Store App. Previous articleAngry bird stella game apk file free download v 1.0.1 for android. Next articleFix “unknown error during application install 24” in android.